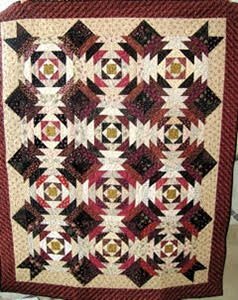 Don’t you appreciate a class where you learn a technique that can be used in many different quilt variations? So do I. Using the amazing PINEAPPLE RULE, by Possibilities, we will explore a number of ways to create your own version of the old favorite, the Pineapple block. There will even be instructions for making a Snail’s Trail with this same process. You choose which size block you want to play with, and come prepared with strips cut and ready to stitch. Instructions for pre-cutting will be sent to you prior to class. This promises to become one of your all time favorite techniques. Instructions for pre-cutting will be sent to you prior to class.